Dacron Comforel® mattress toppers replicate the feel of luxury feather and down fillings yet are 100% hypoallergenic. The Dacron Comforel® ball fibres have great loft and recovery properties making this one of the best quality synthetic fills on the market. 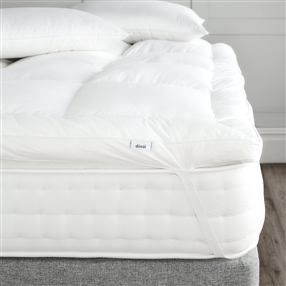 The 100% cotton cassette casing keeps the filling in place eliminating cold spots and irregular padding therefor providing a most comfortable nights sleep. This Dacron mattress topper will help protect your mattress as well as add a layer of comfort and warmth. Our friendly team is on hand Monday to Friday 9.00am to 5.00p.m. to take calls regarding product enquiries or for any other help you need on 01592 321320. Outside of these hours, or at very busy times please leave a message and we will call you back as soon as one of our team is available.